Do you have excess skin and fat between your underarm and elbow? Does it look like a hammock? If so, then you should consider scheduling a free consultation with YOUnique Cosmetic Surgery to discuss either liposuction or an arm lift. Brachioplasty, the medical term for an arm lift, helps solve the problem when arm tissue begins to relax and sag, creating a droopy look. When you meet with a specialist for a consultation, they will carefully consider what will be the best option for you. We are committed to helping you achieve results you’ll love. 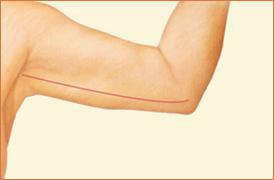 Request a consultation about Arm Lift. Call our office here for more information about Younique Cosmetic Surgery and Med Spa or other procedures we offer. What’s YOUnique about Arm Lift Surgery? The procedure to improve the appearance of sagging skin of the arms involves an incision from the elbow to the armpit, and in some cases to the side of the chest. When performing an arm lift for Santa Monica and Los Angeles patients, your specialist will then tighten the muscles in the upper arm and remove any excess fat and skin, leaving a shaped, contoured upper arm. We recommend that you schedule a free consultation to discuss your options. Younique Cosmetic performs arm lift for normal weight patients and want a minor tightening of their arms. 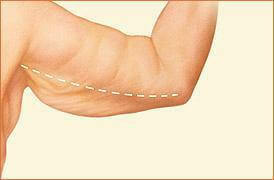 Most arm lift patients recently had major weight loss who have their weight under control and are in good health. If you have excess skin or fat in your upper arms chances are you are a good candidate for an arm lift near our Hollywood office. Patients who undergo an arm lift are usually back to work after two to three weeks, but we advise against heavy lifting for two to six weeks. Upon the completion of your arm lift, you will be given either absorbable sutures or stitches (removed after a week or two), along with substantial dressing to be changed frequently, and also a compression garment to minimize swelling and discomfort. When you are ready to take the steps toward improving your look, request a consultation online here.